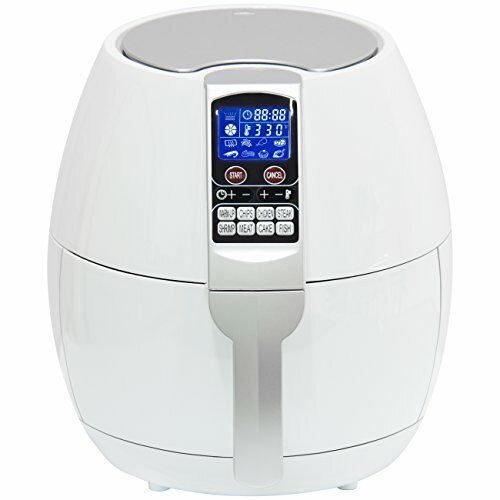 The GoWISE USA 8-in-1 Programmable Air Fryer has several features which makes it stand out. It is an 8 in 1 unit which allows you to combine operations of up to 8 cooking appliances in your home. The recipe book allows you to prepare different types of food. Even if it is your first time trying the process of air frying, the unit has everything you need to enjoy your cooking. Who is GoWISE USA Programmable Air Fryer for? 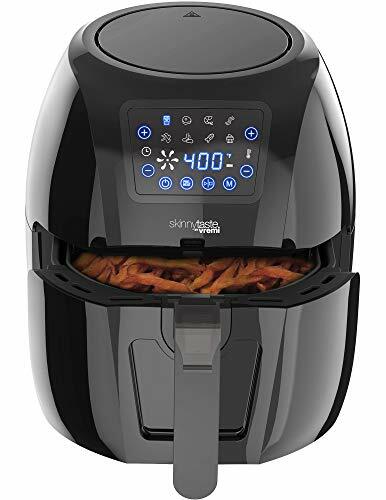 How much does GoWISE USA Programmable Air Fryer cost? If you can reduce the amount of calories you consume, then you end to check on the amount of oils you consume. 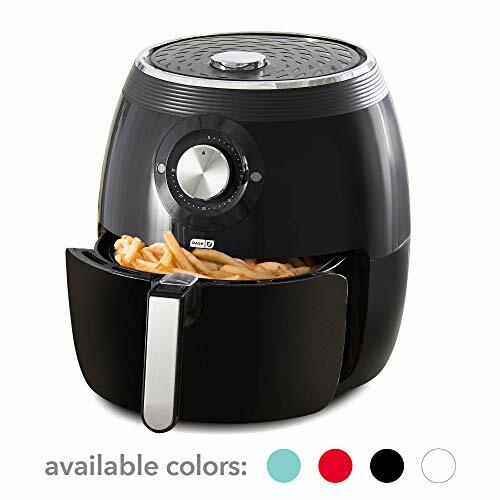 The air fryer allows you to cook food without use of oil. There are different types of foods you can cook in the unit. For instance, you can bake cakes, grill food, roast, make steaks, chicken and even French fries. There is no need of quitting your favorite dishes, even if you are trying to reduce on oil consumption, you can switch to air frying and start cooking food on low oils. You do not have to be stressed on how you can follow the recipe book. 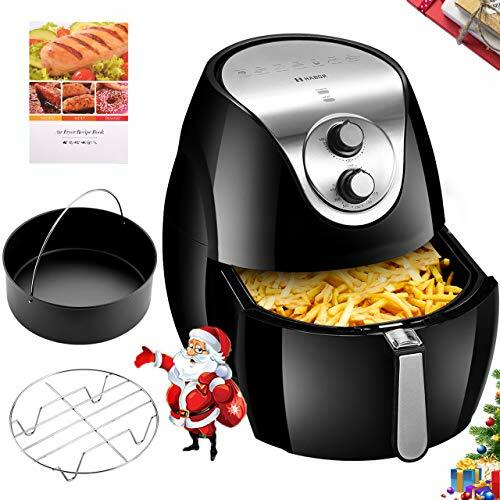 The air fryer comes with 8 cooking presents which you can just choose from a dial of the buttons and the fryer will maintaining the right temperatures and other condition suitable for cooking different types of foods. You can choose the right settings to cook foods such as chips, chicken, pork, shrimp, steak, fish, cake and even pizza. Any healthy food you can think of, the fryer can cook provided its cooking method involves deep frying. You can know enjoy cooking food like professional upon buying the appliance. Cases where you end up with uncooked or burnt food are no more after you decide to introduce the cookbook to your kitchen. It has an inbuilt alarm which reminds you when it is the right time to shake the unit so that food can cook evenly. You are reminded to shake the ingredients in increments of 5 minutes hence making it possible to have the perfectly cooked foods. The pan used in the unit is tested to ensure it is safe for your food handling. The detachable basket is equipped with a cool touch handle which allows you to handle the unit without fear of burning your hands. The detachable frying pan makes it easy to shake the ingredients as you cook them. You cannot run short of ideas when frying your food if you decide to buy the unit. There is up to 50 recipes to choose from when cooking your food. The different meals you can choose from the recipe book. For instance, you can choose specific foods for your dinner, lunch and even deserts. You will never run short of idea. The recipe on the book explains everything on how to get started. The unit is suitable for a family of less than 4 people. 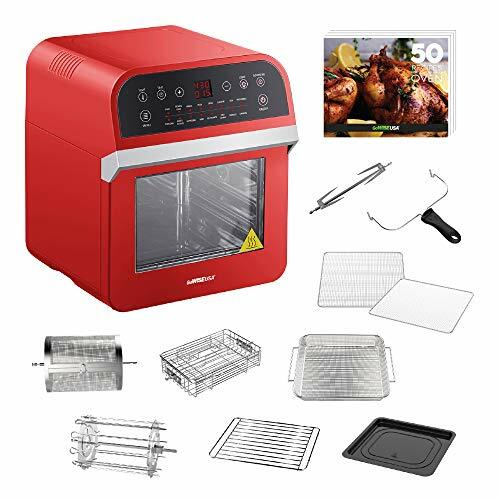 If you have a large family or you would like to prepare a lot of fried foods such as in restaurants, then the low capacity can inconvenience you. The digital touch screen allows you to easily operate the unit. You have up to 8 pre-programmed cooking methods. The touch screen allows you to choose your preferred cooking method and the air fryer will do the rest. If you are searching for an easy to use unit, then the air fryer can be the best to consider. Different settings can be applied on the digital touch screen. The unit has almost everything you need to enjoy your cooking experience. The pan used in the air fryer is PFOA free. It is also FDA approved hence you can cook food with peace of mind knowing the different parts will not expose your food to contamination. Different tests have been carried out to ensure the parts which come into contact with food when cooking are safe. You can always enjoy cooking your meals with peace of mind. The four baskets available in the air fryer have button guards. You can apply the guards to protect the baskets from accidental detachments. Different safety features have been included in the GoWISE USA Programmable Air Fryer to make it a great choice for your family cooking. The pans are easy to detach. You can easily transfer food to a serving plate. There is no struggle when serving the food. The unit is very easy for you to use in your cooking process. With a temperature range between 180F to 400F, you can cook a wide variety of meals. The timer allows you to set up to 30 minute delay. With more than 50 recipes in the recipe book, you can easily play with the temperature settings so that you can easily cook the food. All the features and the technology applied to make the GoWISE USA Programmable Air Fryer a great addition to your home. The only drawback of the unit is the warranty offered on the frying basket. The manufacturers offer only 30 days warranty on the frying basket. It is a considerably short period considering the unit should be able to serve for a long period. It is an affordable unit when compared to other units in the market. 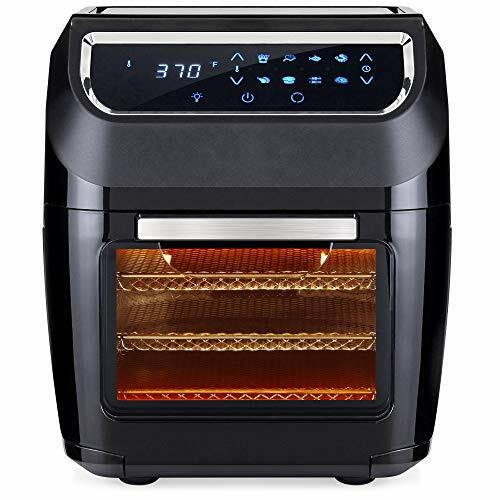 If you are looking for a programmable air fryer which is sold at affordable prices, then you should think of this model. It has all the features you need to enjoy air frying but it isn’t terribly expensive. There are several features incorporated in the system. 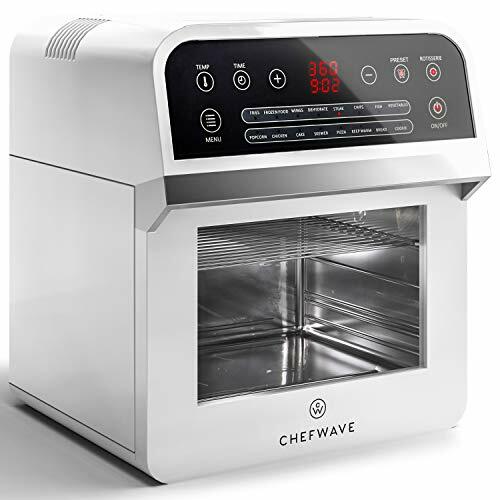 The 8 pre-programmed cooking recipes and the easy to use touchscreen makes the unit stand out. Sleek design makes it a center of attraction in your kitchen. When taking into consideration the different features and the fair pricing, the unit can be rated at 9 out of 10.